This is a rectangular Autolene and Ford Motor Oil porcelain sign. This particular Autolene and Ford Motor Oil sign is predominantly yellow with red and black text. 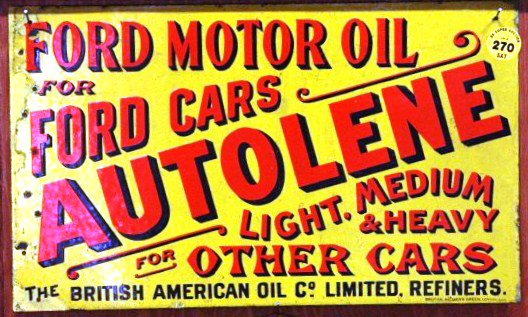 It reads, “Ford Motor Oil for Ford Cars, Autolene Light, Medium, & Heavy for Other Cars, The British American Oil Co. Limited Refiners” and has no other design.